It’s no secret – I’ve always been a big fan of H.P. Lovecraft. From the first time I picked up one of the legendary novelist’s reprinted collections of macabre tales (a very torn-up paperback at a thrift store, when I was about 14), all the way to the first time I watched 1985’s Re-Animator and sat down for a nice maddening game of Arkham Horror – if it was ‘Lovecraftian’ that was good enough for me! Seriously, H.P. Lovecraft is the only author I own audio books for, political propaganda posters for, AND even a cookbook inspired by his works (yes, I’m serious- it’s called “Cuisine From Beyond” go read the review here) – What can I say? I’m a collector; it’s in my blood. So when I was wandering around in the vendor room of ConNooga (which, by the way is sponsored in part by us here at Nerd Nation! Click the ConNooga link for more info on that great con!) 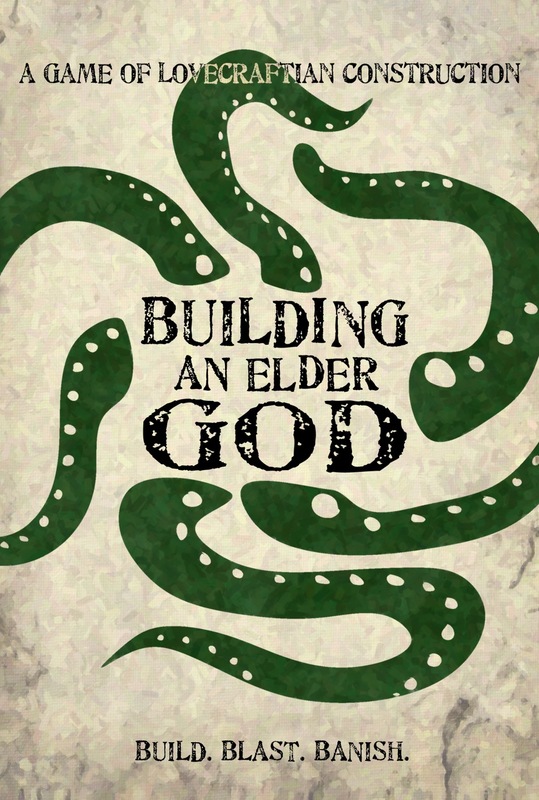 a year or so ago, and came across a copy of Signal Fire Studios’ new game, “Building An Elder God” – it was inevitable that I just had to pick this one up and give it a shot. Now, you must understand that while Lovecraft’s works – particularly anything having anything to do with Cthulhu (who is a Great Old One and NOT an Elder God, by the way!) – are extremely marketable, with oversaturation comes… well, a whole lot of crap. Either they’re trying to completely re-invent the source material, or they’re just doing it no justice whatsoever. Luckily, that is not the case here. “Building An Elder God” actually manages to successfully navigate the fine line between over-complicated and under-simplified. And best of all, they never once mention Cthulhu, or refer to him as an Elder God! 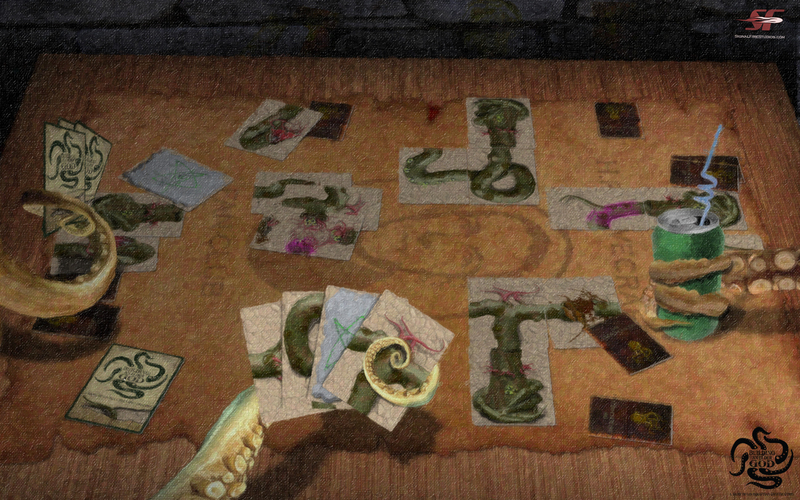 This game knows its mythos! The rules are fairly easy to follow, and one good read-through of the instructions should have you ready to play. 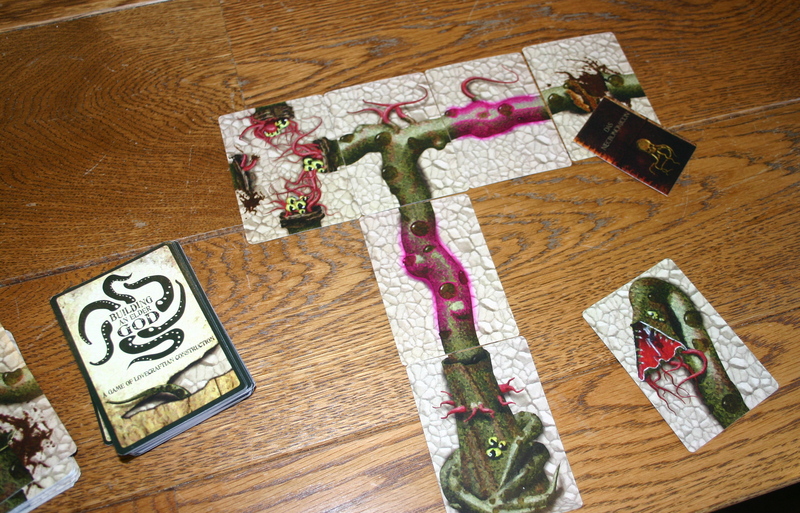 2-5 players each set up their cards, and set off to build their own “Elder God” tentacle monster, while using their “Shotgun” and “Elder Sign” cards to prevent the other players from building theirs, and their “Necronomicon” cards to heal their own wounds. The first player to build a complete monster wins… and it’s just that simple.